Being a long time fan, follower and friend of the band and having been listening to the songs for a long time already, I guess it was about time that I wrote a review for this cool 10" EP. Since their first full length album "The Man They Couldn't Hang"  the band has retired their robotic beat master - the legendary Ghost 707. Instead of the possessed drum machine the duo has now become a trio consisting of ex-Nekromantix guitarist Peter Sandorff and his Hola partner in crime Jeppe on the ghostly Fender bass. New ghost on the block is the human drum machine Kristian Sandorff aka Ghost brother. Together they play what is known as "Mexican surf rock". They love to explain this in details to the mystified persons who ask. "Chupacabra" is the catchy title track and the "single" which will also be out as a really cool video release very soon aka whenever a certain Horror-Henrik stays awake and stops wasting time with that alligator girl! ;) Anyway, I was stunt drummer on this video, and so I have a lot of faith that it will rock. Not because of my 2 seconds of stunt "drumming", but because I saw some of the raw footage afterwards and it looked really great. Hold your breath for that one! The song is an instant smash hit because of the serious percussion top class shiznit provided by Mr. Kristian and because this trio simply rocks. The Chupacabra is a legendary cryptid rumored to inhabit parts of the Americas. It is known to drink the blood of goats in particular. "Soldadera" has been greatly enhanced by the powerful voice of Linda H. Christensen and some cool horn work. It rocks perfectly fine live without Linda and the horns and all, but if you add Linda to the mix - studio or live - it really blows you away. I have yet to hear it with horns live, but someday maybe. Soldaderas were female soldiers who went into combat alongside men during the Mexican Revolution. Another song that really benefits from the horns is the instrumental "Copenhagen Gringo". I honestly don't like this song much when played live because I think it is a bit monotonous and slows things down too much. However on this EP it works very fine and that is mainly credited to the horns. Thanks, horns! There's one more instrumental, simply named "Mexico". This has become an effective and powerful opener/closer for the band. It has that intoxicating feel created from the teasing and playful guitar/horns and then there's them hard beats from drums and bass. 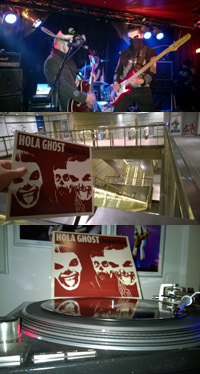 It has a perfect Mexican sound to it blended with pure rock'n'roll. Great stuff indeed. 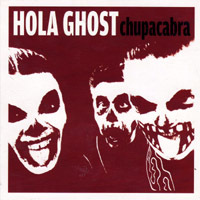 "Old Barn" is the last song and is one of my Hola Ghost favourites even if it's not a typical Hola Ghost song. Peter wrote this one several years ago shortly after his father died. It has that perfect country feel to it which even rivals great songs from people like Hank III. That is some serious praise coming from me, being the total fan of Hank III that I am. I heard this song for the first time live in Tampere - Finland in 2013 and I am very happy it has made it's well deserved way onto vinyl. So be fast like Speedy Gonzales and get your 10" copy before it's too late or you'll have to settle with digital. Everybody has a Mexican surf rocker inside them trying to get out!